Beth Gill, New Work for the Desert, 2014. Performance view, New York Live Arts, New York, March 18, 2014. Kayvon Pourazar, Heather Lang, Jennifer Lafferty, Marilyn Maywald, Stuart Singer, and Christiana Axelsen. Photo: Cherylynn Tsushima. Let us now praise New York dancers. It’s astonishing to think that one could see all of these artists in the span of a mere weekend, and just three shows: IF Immanent Field by Gries at Danspace Project, The Set Up by Cardona and Lacey at the Park Avenue Armory, and Beth Gill’s New Work for the Desert at New York Live Arts. The sheer amount of performance talent in this city—well, it’s ridiculous. And getting such a concentrated dose of it is a reminder that, for all the arguments against living here (the real estate! the weather! ), there is something fiercely particular about New Yorkers, and something particularly sublime about New York dance artists. I don’t know if Cardona and Lacey, Gill, and Gries are in conversation with one another, but their work certainly is. It’s a decidedly downtown conversation—I know, I know, that word doesn’t mean anything anymore, the bohemian diaspora has long since spread around the globe … but still, and yet, there is something to it as a (however fractiously) shared set of values and considerations and aesthetics. And, really, one had only to see how marvelously outraged several Armory audience members were during The Set Up by the confrontation with something indeterminate to feel the uptown-downtown split to be very much alive. And but so, this conversation is all wrapped up in issues of loss and legacy and what it is to push forward, into one’s own unknown, while having a very particular tradition or series of traditions fanning out behind you like contrails: The past exists, only it is forever losing itself. 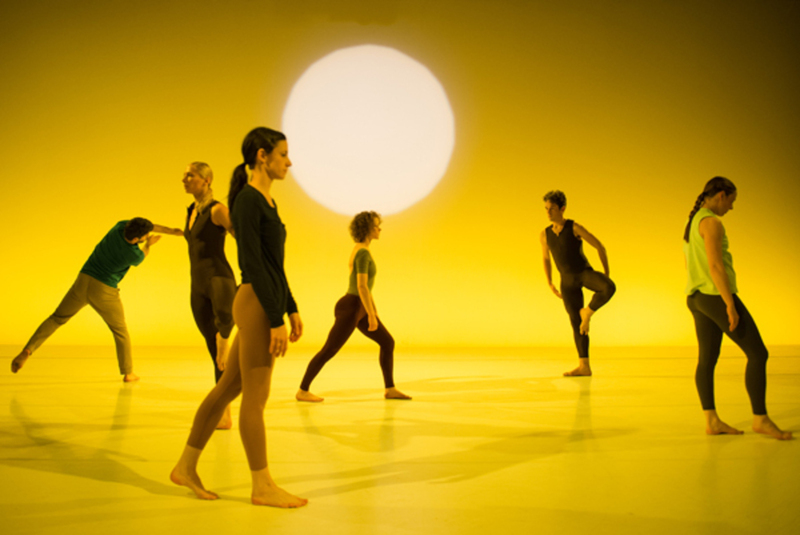 And this brings us, as many things do these days, to Trisha Brown: Gries danced in Brown’s company from 1985 to 1991, and he has put at the literal center of IF Immanent Field Diane Madden, who has spent most of her career within Brown’s company, currently as associate artistic director. She turns slowly, her body sheathed in shimmery silver, arms rising and falling as if in communication with the satellites. Gries, Mapp, and Paz (my god, Jimena Paz, is there anything I wouldn’t watch her do? ), dressed in black, rotate darkly around her, a different sort of satellite constellation. Lance Gries, IF Immanent Field, 2014. 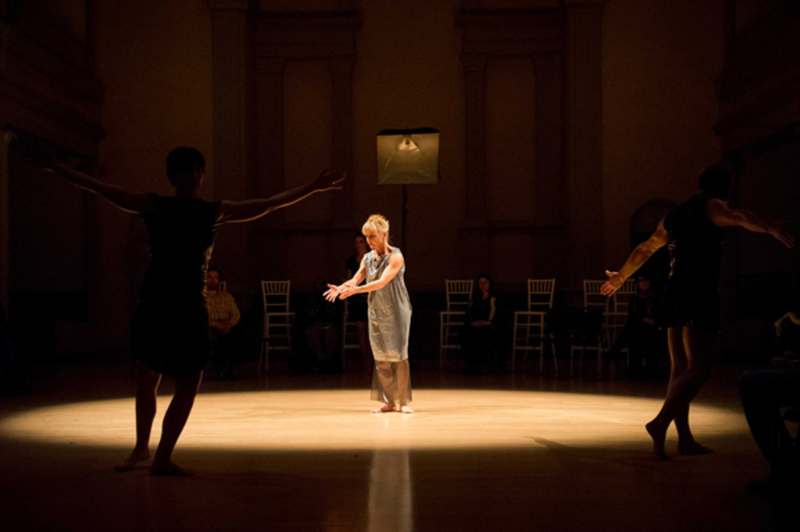 Performance view, Danspace Project at Saint Marks Church, March 18, 2014. Juliette Mapp, Jimena Paz, Diane Madden, and Lance Gries. Photo: Ian Douglas. I have heard mutterings that there was (is?) some upset and or apprehension over Gill’s interaction with Newark, and of course the inevitable discussions around rights and appropriation and all that. I won’t say that these debates aren’t important (of course they are), only that in this particular case I have zero interest in them: What feels urgent and necessary is Gill’s extension of this shared history through the creation of new, decidedly non-derivative work. What else was dance made for, if not this? And still: New Work for the Desert is nonetheless something of a capsule, in that it feels perfectly contained within itself, a hushed, color-saturated world of precise and deliberate body architecture. Jon Moniaci’s spare piano and electronic music, Thomas Dunn’s white-draped set and lush washes of lighting, Terese Wadden’s simple and subtly nuanced costumes: All of the choices here feel right, and most particularly Gill’s clarity of vision, brought to dazzling life by her dancers. The moment-by-moment pleasures of movement invention (and reinvention) delight. So, too, in The Set Up, performed by a trio of New York dance royalty; to watch Cardona, Lacey, and Riener navigate space, to see the intelligence and inevitability of their unanticipated choices, is to feast with mind and eye. Yet The Set Up is both New York and other. This eight-part series began in 2012 at the Lower Manhattan Cultural Council’s River to River Festival; a period of study with an international artist considered a master in his or her discipline initiates each chapter, and this third iteration launched with the classical Javanese dancer and scholar Heni Winahyuningsih. She was not present Saturday afternoon, in the dark red, wood-paneled room at the Armory, full of gorgeous spiky chandeliers and imposing portraitures that proclaim Western power. But her tradition everywhere ghosted the dance, most clearly in the curving blades of Cardona’s open palms, and then again in Riener’s ambiguously echoing limbs. “After awhile the two princesses decide to fight,” a vocalist intoned, and Cardona and Riener had at it, in decidedly stylized fashion. Lacey whipped in and out, or sometimes sauntered, troubling their world, poking at it with her own spikey phrases. Who owns a tradition, a technique? How can you translate it? Must you be on your knees to pay homage? This is the generation (or is it the second generation) we are told, that doesn’t believe in masters, has done away with that idea. Hmmm. Nice try. Thankfully, and as usual, the facts on the ground tell a different story.